What Ubiquitous Insects Are Actually Crustaceans? The Concept of "Type A" and "Type B" Personalities Was Injected Into Pop Culture Thanks To? Among the wide variety of things that creep and crawl across the Earth, there is a very small and peculiar overlap between the oceans and the land. Armadillidiidae, most commonly known in the United States as pill bugs and less commonly as roly polies, chiggy-wigs, or potato bugs, certainly looks like a tiny little insect, but is, in fact, a distant relative of distinctly aquatic creatures like shrimp and crabs. The prolific little bug is actually not a bug at all, but one of the rare crustaceans found outside of water. 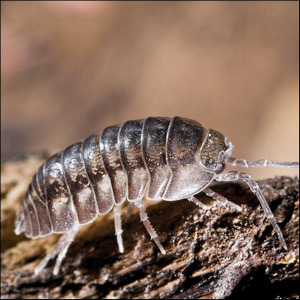 Known as “land isopods”, pill bugs can, like their close relatives the sow bug, survive just fine on land, but do require keeping their breathing apparatus (a primitive type of gills) moist. This is why you hardly—despite how numerous they are in most environments—see pill bugs just strolling around, but if you lift up a patio paver, rock, or log, you’ll often find dozens of them. They prefer to stay close to the ground where moisture collects, and damp soil under stones and rotting wood is a perfect place for them on multiple levels. Not only does the moisture keep them healthy and happy, but decaying plant material like wood pulp and fungi are their primary foods. For most people, pill bugs aren’t a problem at all. They don’t damage structures and a pill bug found inside your home is just lost and can be placed back outside to go on its way. For farmers, however, pill bugs are a significant nuisance since they will happily munch on many common crops such as corn, beans, squash, peas, cucumbers, potatoes, beets, leafy plants like spinach, lettuce, and chard, as well as fruits like melons and strawberries.